Any one of these symptoms can be a sign of a weak charging system. Your charging system is responsible for restoring the charge to your car battery after use and is tasked with providing power to your lights, audio system, and other electronics while your vehicle is running. Without your charging system in proper working order, you’ll eventually find yourself stranded…without lights…and without good tunes. Gasp. To help you avoid such a situation, we’ve put together a basic guide to tracking down potential charging system issues. Problem: Engine starts OK, but the battery does not stay charged. Solution #1: Focus on your battery first. 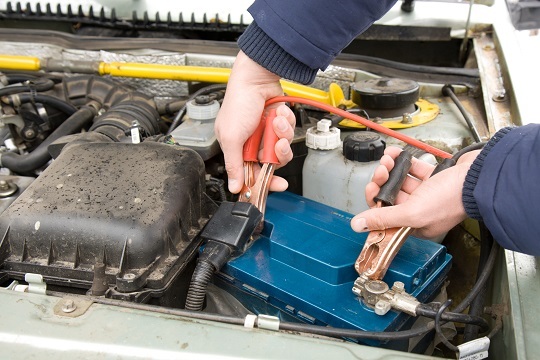 If your vehicle has stopped running, jumpstart the engine, remove the jumper cables as quickly as possible, and wait. If the vehicle keeps running after a period of time, there’s likely a problem with your battery. Take into account the outward appearance and age of the battery when deciding whether to replace it. Also, inspect your battery cables and make sure they are in good shape. Bad cables will not deliver the full current flow needed to operate properly. Crank over the engine, turn on your vehicle’s lights, and observe. If they start bright and then slowly fade, your alternator might not be delivering the proper charge to operate your vehicle accessories. If your vehicle is already dead, jumpstart the battery and wait. If the alternator is bad, your car or truck will eventually die out again as the battery is not re-charged. Solution #3: Check the alternator cables for abnormal wear, including cracking and fraying. Replace or tighten the cables as necessary. Problem: Engine cranks over slowly and lights dim excessively during process. Solution: Slow or labored cranking is often the first sign of an undercharged battery. Use the tests above to determine the problem—battery or alternator. Problem: Lights flare excessively as engine speed increases. Solution: This is usually caused by an overcharged battery, which is typically the result of high alternator voltage. This can be caused by a short or ground in the rotor field winding within the alternator or a defective regulator. Problem: Dim lights or lights that seem to fade as the car runs. Solution #1: Since the alternator is responsible for supplying the auxiliary power to your lights and electrical components, start with the alternator and associated items. First, examine the wiring for damage or wear and replace as necessary. If everything looks good, move on to solution #2. Solution #2: Turn on your vehicle and use a voltmeter to test your battery’s charge. If voltage is below 13.5, there’s a good chance the alternator is not keeping up with your battery’s charging needs and will need replaced. If voltage is around 13.5-15, turn your attention to your battery. Solution #3: If the alternator is supplying proper voltage, chances are the problem lies with your battery. Solution #1: Check the alternator belt for wear or looseness. Replace or tighten as necessary, making sure the belt is properly aligned on the pulley. Improperly aligned alternator belts will often make a whining sound. Solution #2: Check for bent pulley flanges that may cause the belt to run out of alignment. Solution #3: Make sure the alternator is mounted securely so there is not excess movement. Solution #4: Perhaps your alternator has seen better days and is on the verge of failure. Once you’ve gone through solutions 1-3, you may need to consider replacing the entire unit if the noise persists. Problem: The charge indicator light flickers while driving. Solution: At the very least, you likely have a loose alternator belt or bad wiring connection. Start by inspecting the alternator belt for wear and tightening it as needed. Also look for improper wiring connections. If one of these areas isn’t the culprit, you likely have a faulty alternator or regulator, which will need replaced. Problem: The charge indicator light comes on while driving. Solution #1: Again, this could be a sign of a bad alternator or defective regulator. But first, rule out some other possible causes, including a loose or worn alternator belt. Inspect and replace an abnormally worn belt and tighten a loose belt. Solution #2: Check for wiring issues. The two most likely causes are a defective field-circuit ground or a bad light circuit wire or connector. Solution #3: Once you’ve eliminated the belts and wiring as possible problems, you’ll want to test your alternator for proper operation. i just replaced the battery in my 67 camaro due to the fact that after the 1st one wouldn’t start after charging it several times over a 3yr period now when i installed the new one it was having the same symptoms as the old one i don’t think it’s the battery it started up a few times after installation and then quit. i feel its the starter or solanoid it was making a clicking noise when i tried to start the car ,i feel like i threw away a good battery for nothing. what are your coments for this problem. The solenoid will make a clicking sound if the battery is weak or terminals or cables are not perfectly grounded and connected. My battery won’t hold charge in one car but it will in another. The one it won’t hold charge in had some people mess with the wires to install a toggle switch to turn on the fans because the didn’t know to change the thermostat. The alternator isn’t bad a d the terminals are in good shape as well. Please help. Clinton, it sounds like whomever wired the fans may have mistakenly tapped into the alternator wiring, possibly when looking for a power wire. Our advice is to trace and remove that wiring and obtain an underhood diagram for that vehicle so that a proper power supply can be located! It’s OK if the wiring of the toggle switch goes to B+ or the alternator B+ terminal. Fans consume a fairly high current so use adequate wiring and I strongly recommend that you include a relay to carry the load. (Toggle switch activates the relay and thin wiring can be used for this side of the circuit.) Disconnect the positive terminal on the battery and connect ammeter from Bat plus to terminal. With ignition off check if there is a current flow. If so remove all fuses until no current flows …that is where your problem lies. Note that immobilizers often cause dead battery problems if a vehicle is not used for long periods. Also this current draw may not be routed through a fused circuit. Same issue with me. Buick rendezvous, new battery, new Latinate. Old battery charged at 80%. Can jump. Drives fine, but if it’s a short trip. Battery drains completely, doesn’t restart. My 1993 kadett is having alternator problems its not charging the batery when runing and the dash light dousnt work but if I give the dash light a bridge to negetive it works is it possible that the problem is with the bosch alternators regulator? You may want to track down a wiring diagram for your car and trace the wires. We’d also suggest you have the alternator tested at a local parts store to verify that it is working properly. Hay im having problems with my astra mk4 my battery light is on the dials and my battery keeps going flat any solutions ? My alternator has been replaced for the third time in 5 months. Always the same story I get in my car and the battery light and brake light are on usually for a day or so then no power. This time those lights came on and after driving ten minutes each day everything went to normal. I left my car at the shop overnight and they discovered another faulty alternator. Three times in five monts is excessive. Is there a chance that the guys at the shop could be installing this thing incorrectly somehow? same with my 2006 dodge charger,I change the alterator then took it to be tested and nothing was wrong with the alernator,now Im going to chage the battery,cause everything else looks good,any more ideas? My 340 challenger wont charge the brand new battery. I was told that no charge was coming from the Alternator. Installed new Alternator. Same problem. Flat battery after a days daytime driving. Then told no power coming out of the Voltage Regulator. Installed new voltage regulator . Same problem!!. My battery is in the boot but was never any problem until recently. Auto Sparky has bailed out saying theres nothing else it can be ! Help. Grounds are very important in any electrical system. Make sure that the area where the regulator is mounted is free from any dirt/debris/paint. Make sure the alternator mounting brackets are clean where they meet the alternator case as well as where they meet the engine block. Make sure your battery cables are newer and free from any corrosion down deep in the wire under the insulation. All wire/cable connection points must be tight and clean. Consider adding some dielectric grease to these connections to prevent future corrosion and connection problems. I changed the alternator and battery and went to start it but it just made a clicking noise. Can the radio wiring be a problem? Lisa, it could be as easy as the belt is a tooth off. We’d recommend calling the Summit tech line at 330-630-0240…they can help you track down the specific problem. Did u check to see if it is Ur battery? Most places will test it for u and let u know if it’s any good or not. 97 CRV–battery 4 months old-had a no start condition-put charger on and started fine. Battery charging volts at 14.3 running, tested at the terminals. With key off the battery voltage is 12.60. Removed the negative cable and tested voltage between the cable end and negative battery terminal and got the same 12.60 volts. It seems I’m getting a 12.60 drain, can this be caused by a bad alternator(diode)? Any other suggestions ? Thanks for any incite. We agree you have a draw on the system. Try pulling one fuse at a time while a friend watches your volt meter. When the draw goes away you’ve at least narrowed it down to the circuit containing the device causing the draw. You can then inspect wiring and anything else in THAT circuit to pinpoint the problem. One of the electrical circuits in your car has what is called a “small amp draw”. Similar to leaving your lights on overnight, this circuit draws a small amount of current over a long period of time. Bare wires grounding out or something (coin) lodged in the lighter socket are the most common reasons for a small amp draw. Hiya, great tips 🙂 I just had my battery changed on my mitsubishi FTO as id started to have problems starting it. It jump started immediately and didn’t cut out at all afterwards, even at idle but would hold a charge. My worry now is that my internal voltmeter is still only reading 12 or less, instead of 14 and I’m worried this means there’s something else going on, ie my alternators not producing enough current? Thanks Jen. Using a multi-meter; check the voltage right at the battery. That voltage reading should be the same as the reading on the dash gauge. If the reading at the battery is higher, you may have a bad connection at the dash gauge or a bad gauge. While hooked at the battery, start loading the alternator by turning on accessories such as headlamps and heater blower motor. The alternator should maintain a healthy voltage of between 13.2 – 13.8 volts. Thanks for replying, well my worst fears were confirmed. Driving home the other night the car died. Firstly I noticed my voltmeter reading practically zero, then the speedo stopped working, then I stopped in traffic and it died completely. No lights, no alarm, nothing. I’m a bit peeved as I took it to a local garage to have the systems checked and it was they who changed the battery. I made it clear at the time my voltmeter was reading under 12 and that I wanted it checked for battery, drainage and the alternator. When I got it back it started fine but my voltmeter was still reading 11 or 12 and j mentioned this but was fobbed off. Personally I don’t think they tested my alternator, I think they just went for the easiest solution. That was exactly 2 weeks ago and now I’m having to replace the alternator after spending £70 on a new battery which I feel may have been unnecessary as I think it was the alternator all along? I have Put in a new battery, battery connections, and alternator and belt tensionser and still have a needle that dips low in my 94 f150. when i have the heat and lights on at a stop it slowly starts to drop and its scaring me because i wanna fix it before winter and dont enjoy breaking down on the highway in the winter. My next step is the solenoid. Please if anyone can help let me know. im at my wits ends with a flat wallet. Your electrical system relies on the alternator to supply power but, in the event that it (alt.) would go bad the battery would continue to supply power until it were drained! The fact that other parts of the system failed at different times is telling of a potential wiring issue on the truck, possibly a bad ground wire. It would be useful to obtain a wiring diagram in order to trace it properly. I have the solution to fix it i have an 04 Focus and I replaced everything and still same thing runs and then dies its the wire that comes from alternator the thick wire that bolts on the back and goes to front of the fans and then to starter solenoid that wire right in front of fans has a plastic rectangle coverd in electrical tape so you may not see it so feel for its a special fuse that corrodes break it open and jump it with a thick copper wire like an amp power wire solder the piece of wire to the both sides to eliminate that crap and all your problems are over trust me not even ford could tell any thing its easy and cheap repair.From Tony The Monster!!!! I put new terminals on my battery I charged it with a trickle charger for about 2 hrs no problem starting and restarting it but if I leave the car off for a few days and not drive it I retry starting it and there is not power in my car? I replaced my battery and had the alternator tested and it tested fine. Car runs fine, but when I idle and have the defrost or heater on high my headlights fade in and out. My dash lights remain bright. David, great article. I think it’s my alternator. I have a 2007 Chrysler Town and Country. Do you have a guide (preferably a video) on how to remove and replace the alternator. I’m trying to save money. My car showed the battery light and the power steering decided to go stiff. Checking the battery 12.5v…..with eng8ne running and all elecs on dropped to under a 11v. Following night, I checked again but now have 13.9v. fully loaded and over 14v other times. I thinks its a fault with the alternator. Isit possible water ingress could cause intermittent fault… it was wet when the fault appeared. Sounds like a belt issue if your power steering is going stiff the same belt should run your altenator. Check it for tension, or signs of wear. Sounds like a bad altenator. Autozone or orielly can check and see if its charging without pulling it out of the car. Im working on a 99 chevy c2500. The battery light stays on but the altenator is new the batt is new the belt is new the computer is new and wiring from the alt to batt and computer is all in good working order. The altenator is charging just fine. But the dang light wont turn off. Im stumped. Any ideas? I just had a similar problem with my ’98 ford expedition. First the battery light came on and the lights were dim but it ran fine. Then after about a week the battery stopped charging and I couldn’t get it to hold a charge. I replaced the battery, cables and alternatior before I found out it was all due to a blown fuse. I have a 2003 chevy silverado 1500. I replaced the alternator because it was bad. Now once again my truck is not wanting to stay running even after jump starting. That amps on the alternator are all over the place. Even though it’s new could it be bad? Can the battery make the amps jump like that? Please help I’m getting desperate. What gauge are you using to read this? If it is the factory gauge in the dash; then that is a voltage gauge. That gauge should read steadily above 13 volts. Amperage will move around a bit depending on the load applied to the charging system. If your gauge is jumping “all over the place,you have either a faulty ground,or a direct short,which is DANGEROUS! Wires will get HOT very quickly,and can burn-out components,such as alternator,ign switch,ammeter/voltmeter,and may even cause your battery to explode! Check your ign switch to ammeter,wiring. If you see any sign of over-heated wiring under the dash,trace it to the source before the problem becomes a burned-up vehicle! Just wondering if you could help me out here.. I was driving along on the highway. And my car made a weird little noise and shut off, and won’t turn over at all. The lights and radio and everything comes on and she makes a little click when you turn the key.. Wondering if you know what the problem would be here? I have a 2006 Ford fusion, 2.3l 4 cylinder, 5 speed. so ive got a 1995 F-150 and ive replaced both the regulator and alternator and ive used several batteries big and small but whats happening now is that it its around 11.89 off then i jump it on and its up to a constant 12.03 and the alternator reads from 14.97 to 15.12 and it stays on untill i shut it off then it wont turn on again the battery then reads 10.54 and drops to 8.68…. whats going on?? Husband and son changed alternator in 1998 Silverado, charged battery all night, now it says 19 amps. What is the problem?? Hi i have 2012 ford focus manual transmission and i have frequently problem with engine start i run my car regularly but some days my battery need jump start after fully charge, i charge my car battery at home with 20amp automatic charger. It normally stop charging when its full. Also my battery idicator shows green. But still i need to jump start please advise me what i need to do with this? The first thing to do is make sure that the battery terminal connections are clean and tight first, then check to see whether the charging system is working correctly. With a volt meter attached at the battery terminals under the hood, what reading are you seeing with the headlights and blower fan running on high? It should be 13.2 – 13.5 volts. If this checks out ok, have the battery load tested at a local parts store or repair shop. Replace as necessary! okay, i have gotten so much stress from my 2003 ford since buying it used in a junk yard. it really has me so irritated. i replaced my battery with a new one, and my alternator like 5 or 6 times. there are other minor issues that i haven’t gotten to yet. the issue is that the charging system light will not turn or shut off which leads me to believe that there may either be wiring issues or worse. However, i have spoken to four mechanics and no one can help me with a clear answer unless i pay a lot of $$$$. i bought the car used for 2,000 and already have cleared my savings from the last two repair jobs. does anyone have any advice or comments. Wiring issues can be a real nightmare, especially when a previous owner has installed any aftermarket equipment such as gauges, stereo systems or keyless entry. Other than checking obvious things such as battery terminals, alternator plugs and grounds, past aftermarket part install or removal is another great place to start looking! I have a 06 f150 I’m having an intermittent issue with the gauge cluster. When I’m driving the gauges and radio will shut off and after a minute come back on. Some days it happens somedays it doesn’t. I don’t want it leading to a bigger problem. What could cause this issue? I had it checked but the device said the engine wasn’t throwing any codes…please help. Woke up one morning and vehicle would start,Took the batteries and alternator in to be tested. alternator was good both batteries were drained. Got home put everything back in same happened the next day. Replaced both the alternator and the main battery. Vehicle runs gauge is where it is supposed to be until i stop then the gauge jumps down. What would cause this to happen? 81 pickup, battery light is on, has new regulator and alternator. The light went off when i replaced the regulator and the next day i put the new alternator in and it came back on. Could it be the alternator is faulty? After reading your brief description it sounds as though you may have a few things going on. First, it sounds like something is drawing on the battery even when the key is in the off position. Over time this not only drains the battery and eventually kills it, but it makes it difficult for an aged charging system to recover a failing battery. We have a 2002 Chrysler voyager the battery light came on while driving we replaced the battery because it burnt up auto zones charger when trying to see if it would charge. About a day later battery light came back on so assuming it’s a bad alternator. Well my husband drove it still and when he got home the tranmission seemed to slip or go into nuetral but finally went back into gear then when he pulled in front of the house the dash lights started going nuts and the speedometer was bouncing around everywhere and the windshield wipers came on by themselves. Could a bad alternator cause this or is this a bigger problem. I have 1998 mercedes benz E320. The battery ins not holding the charge even though it is new. I tested the battery voltage by a multimeter while the engine is running it reads 13.55 -13.70. I installed a new alternator be the battery voltage remains the same. What to do? I get into the car place the key in the ignition and the car doesn’t start. I charge my new battery and the car starts I then hear a rattling sound as though something is about to fall out. I get to my destination and when I get back into my car my car will not start without another charge. Could it be my alternator? Just based on your quick comments, it would be hard to diagnose. We’d suggest giving the Summit tech line a call at 330-630-0240. They’ll have some follow up questions for you. Thanks for reading! 2006 buick rendezvous alternator overcharges for about a minute then everything is normal….new battery and new alternator. my battery has a charge but my car keeps dying. the alternator reads 14-14.5 at start up but within a minute it reads 0 and my car dies. Alternator? Battery? Both? It’s rare to see a volt gauge actually go to zero! We’d suggest a call in to the Summit tech line at 330-630-0240. It’s unfortunate today but, you generally get what you pay for in electrical parts especially when it comes to starters and alternators. It sounds as if you will need to replace the alternator in this case. Hello, my problem is that after testing the alternator with multimeter (14.3dc) when on and replacing the battery now a couple times my car 2010 dodge journey will still lose its charge over night. Is there possible another component that might need replacing. Also no rust, dirt, and passed a obd2 scanner. Appreciate any help or advice. I just has a question if anyone had any ideas. I have a 97 ford ranger 4 cyl. I have replaced the battery twice and alternator twice in less than a year. When I jump start the car it slowly loses it charge and even after fully charging the battery at the place I bought it and still wont hold a charge. I’ve looked online and saw something about the alternator fuse? Any ideas would be appreciated this truck has been great and would hate to sell it or spend tons of money at a mechanic over something little and easy to fix. It sounds like you are experiencing what’s called a parasitic battery drain. This is easily checked using a volt meter if you have one and there is plenty of easily searched info on the web about it. Removing the ground path on a running vehicle is naturally going to shut the car off. It appears you have what’s referred to as a “parasitic battery draw”. This means there is some circuit in the car continuing to use power even after the car is shut off. Best advice is to seek the assistance of a repair shop or do some research and buy yourself a multi-meter and a test light. Also, a wiring diagram for that vehicle may be a handy thing to have as well. What if the car doesn’t even want to crank but the dash board is lite up? I jump it, the lights turn on but the car won’t start. why alternator not charging when i use aircon of bus? I charged my battery and the car finally will turn over, but as soon as i shift to reverse (or it was the breaks) the car dies. Then I cant get it to start back up and have to recharge more. Did this twice, cant leave the house..
Hmm. You’ve got us a little stumped on this one. 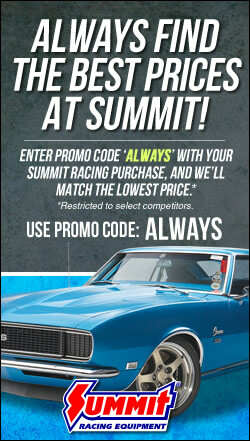 We’d suggest a call to the Summit Racing tech line: 330-630-0240. I have replaced the alternator on my ford f 150 2003 truck WHAT IN THE WORLD IS GOING ON WITH THIS VEHICLE i am tired of this situation please heeeeeeelp!!! Bought a brand new battery and a multimeter due to starting problems and found that when my lights are ON I get 14v when the engine is running and when the lights are OFF I get 12v ish when it’s running?! I have 1994 Toyota T100 and my dad and I have replaced the battery, alternator, and the 100amp alternator fuse. We’ve been having issues with the truck not staying charged and we’re at our wits end trying to figure out what’s wrong. I have to charge it over night so I can get to work and leave it running BC I’m afraid it won’t start. If anyone has any input as to what could be wrong please help my dad has been working on cards and trucks for about 40 years and he has no idea what is wrong. We’ve checked and tightened and replaced just about everything considering the starting of the vehicle. after about a month of driving, my car battery suddenly drains. when i had it charged, it lasts again for about a month. what could be the problem with my car? I have a ford E350 that I have replaced the alternator (had it tested. the new alternator is good) but it is not charging. Checked all the wires with a continuity tester and no broken connections. I can not diagnose what the problem may be. Any suggestions would be appreciated. Assuming it is an internally regulated alternator, and it has been bench tested on a reliable quality tester and verified to be a good unit, the only thing left is wire/connector integrity, voltage supply or ground issues. My car is not starts many times, when i get stuck in traffic jam and signals. its battery problem or any other issue. By the way my car battery is 3-4 years older. Might be its battery problem, should i replace it. If the battery has been discharged quite a few times then yes, replacement might be best. But, also check that the alternator is charging at least 13 volts with a few devices such as headlights and heater fan motor running. If not, it may also be necessary to replace that too! The local “chain” Auto Parts Stores such as Auto Zone, O’Reillys, etc., are the do it yourselfers best friend, as they actually advertise that they will Load test your Battery and do an Amperage draw/Voltage test on your Alternator and the complete Charging System for free! Not to be out done, some will even do the part replacement work on all new parts you purchase from them for free! This eliminates the dreaded and expensive part swapper Mechanic, because Electrical parts are not returnable once installed and used, on your Vehicle! Besides the cost of the part(s) you get free and guaranteed done right work!!!! You can’t beat this! What surprises me is the very few people aware of this! I just got my car out the shop. When my car was on the lights on the dash flicked. (ex: odometer) would flicker and depending on my speed it would increase in flickering or decrease. When I picked it up I played my music and 2 minutes within driving it the radio shut off but then came back on again. It did this a lot before I put it in the shop. I also got the fan replaced in the car btw it’s a 2007 pt crusier. I know they removed the battery to install the fan so I’m thinking they didn’t properly put the post back on. The positive one isn’t all the way down but It’s even at the top of the positive metal (not sure of the name but it’s the positive metal part that’s attached to the battery) that gives it it’s charges and it’s tight there is no movement. I don’t know what’s going on with the car. Also the alternator was replaced like 5 months ago too but by a family friend. Electrical problems such as this can be some of the most difficult to diagnose. Anything from a low battery condition, poor grounds and or poor connections can really give you a run for your money! Unfortunately, there is no easy email answer for this. It is going to take an experienced technician some hands on time to figure it out! I have a problem with my sedan a nissian.After alignment, about 4 hours, I stopped at some place and switched off. On coming back to start, couldn’t but cranks like battery low. I jump start it move to point B, when i switched off, same problem again. Could it be alternator not charging the battery? Or battery itself? 2003 Expedition. I tried to start it one day, didn’t start, got a jump start. I left the battery charging over night at auto zone, picked it up in the morning battery was good and held a charge, installed it and took vehicle to auto zone to test the alternator. Their machine said I had a bad voltage regulator, bought a new one, installed the new one, same problem. They checked the old alternator on their bench test and it passed the test. So battery good, old alternator good on bench test, new alternator didn’t work in vehicle. I figured maybe the alternator cable, replaced it… nothing! Still can’t get a charge going, what else could it be? Fuse? Relay? I don’t know, I don’t want to spend 160 bucks on a battery if thats not the problem. Please help. Ryan, call the Summit guys at 330-630-0240 and they’ll be able to help you. They will certainly have some follow up questions and this will be the fastest way to your answer. I have an 06 cobalt that I’ve recently started having problems with. I replaced my battery about 4 months ago and after that everything was okay. Still spotty here and there. I couldn’t let my car set for more than 2 days or else it would be dead. So the past week my car just makes a clicking noise whenever I try to start it. Once it’s jumped it does fine. But it can’t even sit 24 hours without it needing jumped. All the lights and everything turn on when I try to start it. It says check charge systems. Help!!! Kayla, this seems like an alternator issue. 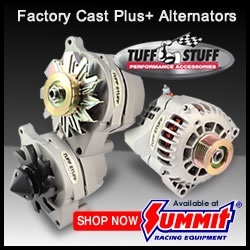 We’d recommend a call to the Summit guys at 1-800-230-3030 to confirm but they can get you hooked up with the right replacement parts. Hello, I am at a loss. I have a 58 Ford Fairlane. I bought in February. Within a couple of months my headlights started flickering (disco style). When they are on, the brake lights do not work. I have replace the battery cables, the generator (alternator) the voltage regulator and another headlamp switch, I found on ebay. The last thing, the voltage regulator, when that was changed, everything worked like a charm for 45 minutes. An hour later the lights are doing the same thing. I am at a loss. Please help. Thanks. the car runs great, but would like to take it out at dusk and be out after dark sometime. 2000 buick park avenue ultra. Changed battery and alternator.. Battery still not charging… Any help is appreciated..
i have a 95 toyota tercel dx i left the lights on one day and my battery was drained, i recharged the battery and found that a bunch of fuses had blown including The 100amp alt fuse, since then i have replaced all the fuses but my car keeps going dead thought it was the alternator so i bought a new one and a new Battery as well, still after replacing everything, my car keeeps going dead. any solutions ? Did you check the main battery ground cable to the chassis, making sure to connection is free of rust and corrosion? Did you clean the battery terminals and relevant connectors? Are you running an extra electrical accessories? Our pal Jeff Smith just wrote this a few days ago and it may help too. why is that the wire for my alternator is getting hot to the point that is melting the plug rubber connections. I change the fuel real pressure sensor. and when I turn on the motor the wire that connects to the alternator gets hot. ’85 Ford F150, 3.9L I6, 4wd. 200 miles from home, Battery dies and won’t recover from external charger. Installed new battery & before heading for home, had alternator & external voltage regular tested…Alternator tested good but the VR tested bad & replaced. A week later, stranded again. Tested system again and alternator now bad, VR tested good. replaced alternator & headed home. Did not make it. Battery drained all power. Throughout all of this, Ammeter not registering charge or discharge. Is the ammeter active or passive in the loop. In other words, do i need the ammeter working to complete the loop? Charged battery again and stopped to figure this out. Not going any where till fixed. I have a 1991 GMC Sierra that when it is cool/cold outside, the electrical gauge shows that it isn’t charging when the engine is running but when it is warm outside and i start the truck, the gauge shows that it is charging around 14 – 14.5. Does anybody know what is causing this or where to start? James, please call our partners in the Summit Racing technical department at 330-630-0240 as they’ll likely have a few follow-up questions regarding your Sierra. Thanks for reading! i have a ’75 GMC truck, alternator wont charge the battery, i replaced alternator twice, starter once and ran a jumper wire from hot terminal on back of alternator to positive post on battery, didnt help, any suggestions? What problems could I be facing? My js205excavator the battery was problem while working in field,does the problem in alternator or battery?